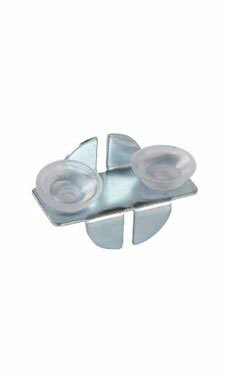 To protect your shelf and prevent movement and sliding on your shelves, use these Glass Shelf Clips! These clips were made for the front of a shelf bracket only. To use, all you have to do is slip the clip onto the front of your shelf bracket. Then, rest assured that your shelves aren't going anywhere! In stock and available for immediate shipment. These rubber bumpers hold the glass shelves from moving and are easy to install. Could not ask for anything better!